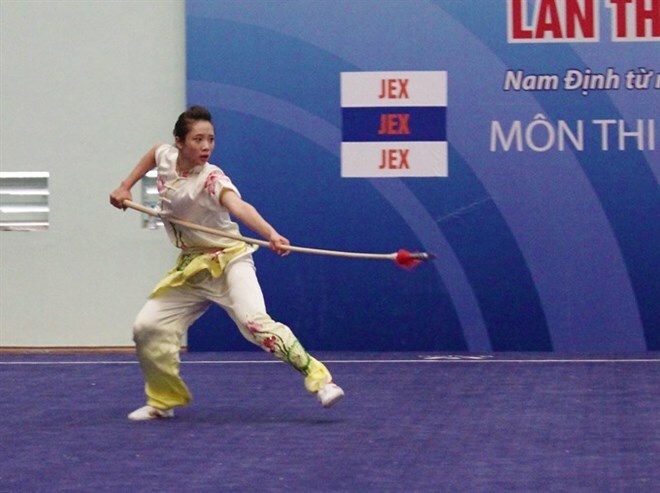 Hanoi (VNA) - Wushu will remain one of Vietnam’s strongest sports at the upcoming 29th Southeast Asian (SEA) Games in Malaysia. Vietnam will send five female and seven male artists, who are seeking two golds and five silvers at the regional biggest sport event. “The players are very healthy and ready to bring glory to the country,” said head coach Nguyen Van Chuong. At the 28th Games held in Singapore two years ago, Vietnamese wushu artists won four golds, four silvers and three bronzes. However in the Games in Malaysia, the sanshou (combat) category will not be played. Therefore Vietnam will target titles in the taolu (performance) event. Among participants to compete in the Games, Duong Thi Thuy Vi is a golden hope for Vietnam at the event. Vi won the gold medal in the Asian Games in 2014 in the Republic of and two gold medals in a row in the 27th and 28th Games. “I always set a highest goal and will make every effort to gain success,” said Vi. According to Chuong, Vi practices very hard and learns by herself to create beautiful movements when performing. “I hope that she will continue playing to her strengths and bring the country high honours,” said Chuong. In preparation for the Games, the team has trained in Trinh Hoai Duc Gymnasium in Hanoi since early this year. Apart from practicing at home, the team underwent an intensive training programme in China under the guidance of Chinese experts. The team also played well at the national event to improve their skills and techniques. Vietnam’s wushu athletes, who gained five golds, three silvers, and four bronzes in the 27th Games, will begin their competition on August 20-22. To encourage coaches and athletes’ spirit of Hanoi ahead the Games, the municipal People’s Committee will co-ordinate with Department of Culture and Sports to host a meeting on August 7. The event aims to praise efforts of Hanoian coaches and athletes during the process of preparation for the tournament in Malaysia. Vietnam’s 681-member sport delegation, including over 400 athletes, will go to Malaysia to compete in all 32 sport events, hoping to gain over 60 golds to be in the top three at the regional tournament, according to the National Sports Administration.